Half year ago Blend4Web was first released publicly. In this article I’ll show what Blend4Web is, how it is evolved and and how it can be used for web development. In short, Blend4Web is an open source framework for creating 3D web applications. It uses Blender – the popular open source 3D modeling suite – as the primary authoring tool. 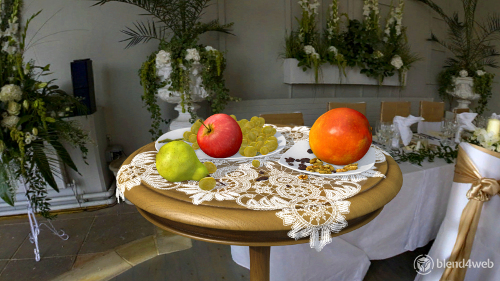 3D graphics is rendered by means of WebGL which is also an open standard technology. The two main keywords here – Blender and Web(GL) – explain the purpose of this engine perfectly. The full source code of Blend4Web together with some usage examples is available under GPLv3 on GitHub (there is also a commercial licensing option). On June the 2nd Apple presented their new operating systems – OS X Yosemite and iOS 8 – both featuring WebGL support in their Safari browser. That marked the end of a 5 year cycle during which the WebGL technology has been evolving, starting with the first unstable browser builds (if anybody remembers Firefox 3.7 alpha?). Now, all the major browsers on all desktop and mobile systems support this open standard for rendering 3D graphics, everywhere, without any plugins. That was a long and difficult road, along which Blend4Web development has been following WebGL development as a shadow. Broken rendering, tab crashes, security “warnings” from some big guys, unavailability in public browser builds, all sorts of fears, uncertainty and doubts. All this didn’t matter, because we have the opportunity to do 3D graphics (and sound) in browsers! The first Blender 2.5x builds appeared in summer 2010. At the time we, the programming geeks, were pushed to learn the basics of 3D modeling by the beautiful Sintel from the open source movie of the same name. After choosing Blender, we could be as independent as possible, with a full open source pipeline organized on a Linux platform. Blender gave us the power to make our own 3D scenes, and later helped to attract talanted artists from its wonderful community to join us. Our demo scenes matured together with the development of Blend4Web. 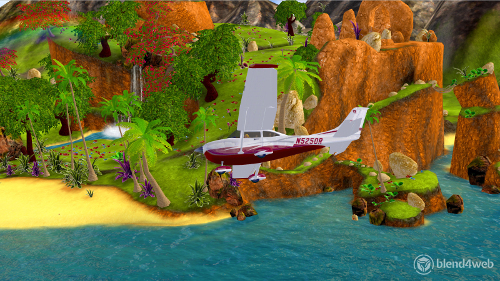 The first one was a quite low-poly and almost non-interactive demo called The Island. It was created in 2011 and polished a bit before the public release. In this demo we introduced our Blender-based pipeline in which all the assets are stored in separate files and are linked into the main file for level design and further exporting (for this reason some of Blend4Web users call it “free Unity Pro”). In Fashion Show we developed cloth animation techniques. Some post-processing effects, dynamic reflection and particle systems were added later. After Blend4Web has gone public we summarized these cloth-releated tricks in one of our tutorials. 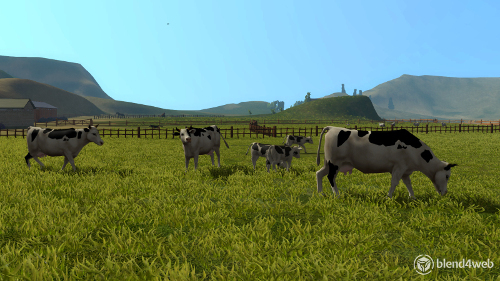 The Farm is a huge scene (in the scale of a browser): over 25 hectares of land, buildings, animated animals and foliage. We added some gamedev elements into it, including the ability of first-person walking, interacting with objects, driving a vehicle. The demo features spatial audio (via Web Audio) and physics (via Bullet and Asm.js). The Freedesktop folks tried it as a benchmark while testing the Mesa drivers (and got “massive crashes” :). quite simple and old-school, as we had no support for visual shader editing yet. Things have changed when Blender’s node materials have become available to our artists. They created over 40 different materials for the Sports Car model: chromed metal, painted metal, glass, rubber, leather etc. In our latest release we stepped even further by adding support for the animation control by the user. Now interactivity can be implemented without any coding. 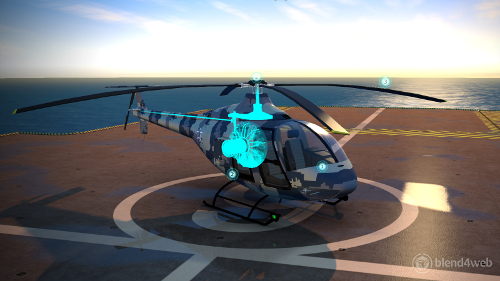 In order to demonstrate the new opening possibilities we presented interactive infographic of a light helicopter. Among the other possible applications of this simple yet effective tool (called NLA Script) we can list the following: interactive 3D web design, product promotions, learning materials, cartoons with the ability to choose between different story lines, point-and-click games and any other applications previously created with Flash. The most wonderful thing is that your Blender scene can be exported into a self-contained HTML file that can be emailed, uploaded to your own website or to a cloud – in short shared however you like. This freedom is a fundamental difference from numerous 3D web publishing services as we don’t lock our users to our technology by any means. For those who want to create highly interactive 3D web apps we offer the SDK. Some notable examples of what is possible with the Blend4Web API are demonstrated in our programming tutorials, ranging from web design to games. As you can see the APIs are structured in a CommonJS way which we believe is important for creating compact and fast web apps. There are many possible ways in which the Internet and IT will be going but there is no doubt that the strong and steady development of 3D Web is already here. We expect that more and more users will change their expectations about how web content should look and feel like. We’re gonna help the web developers meet these demands with plans to improve usability and performance and to implement new interesting graphics effects. We also follow the development of WebGL 2.0 (thanks Mozilla for your job) and expect to create even more nice things on top of it. Read our blog, join us on Twitter, Google+, Facebook and Reddit, watch the demos and tutorials on our YouTube channel, fork Blend4Web at GitHub. Founder and development lead of Blend4Web - the open source framework for creating 3D web applications. Awesome work!, it makes really simple get a 3D model in the browser. Please add an RSS feed in your blog so we can subscribe for blend4web updates. Ok, we’ll think about RSS. Thanks for your interest!